FinTech – shorthand for financial technology – is disrupting traditional banking services across the globe. It began with payments but is now knocking on the doors of every other service a traditional bank provides, including credit and savings. Silicon Valley is pouring money into FinTech, even as investors recognize only a handful of the thousands of new companies springing up will be around three years from now. The financial institutions targeted for disruption by FinTechs are, of course, wary of the huge risks inherent in exposing their clients’ personal and business assets and information to the dark side of the internet where cyber criminals always seem to be one step ahead of the security systems. Despite this reality, the digital revolution is here to stay and cannot be ignored if a financial institution is to retain its existing customers and attract new ones. Properly deployed, digital technology can allow for the processing of loans that used to take weeks or even months in a matter of hours. It can make possible the creation of more flexible products and services that make customers lives easier and more productive. At FINCA, we are mobilizing all the resources at our disposal to take advantage the exciting new possibilities FinTech represents. One of the big challenges any “legacy” financial institution faces in entering this space is to identify which investments will offer a longer term payoff and which will be obsolete before the paint dries. In the Democratic Republic of the Congo, FINCA was an early adopter of Point-of-Sale (POS) devices to empower a network of over 800 agents to disburse loans and collect repayments and savings deposits, obviating the need for our clients to travel to our branches. The uptake of this innovation was faster than we had ever imagined, and today 70% of our transactions are on this network. In addition to saving our clients time and money, it also means they don’t have to walk home at the end of each work day with large amounts of cash in their pockets, exposing them to assaults and muggings. In Pakistan, we are about to roll out a mobile wallet which we hope will make transactions faster and easier for our existing customers as well as attract new ones. In the Congo, the IFC and MasterCard Foundation were valuable partners in enabling the agent innovation. In Pakistan, a FinTech called – appropriately – Finja, is partnering with us to launch the wallet. But even as we put these new technologies to work, we keep looking over our shoulders to see what new disruptors are on the horizon. 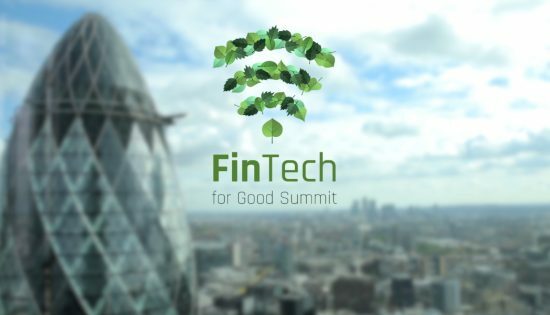 To help FINCA navigate through ever-changing landscape, FINCA UK and the Rainmaker Foundation, a collection of UK philanthropists, hosted the FinTech for Good Summit, convening some of the brightest FinTech minds in London to explore how the products they’re building today can benefit the world tomorrow. To “lay the table”, I opened my remarks by noting the myriad challenges the younger generation faces today, as custodians of the future: climate change, regional conflicts, shortages of food and water, scary epidemics, and a rapidly growing population for whom job prospects are melting away in the face of new technology. To my surprise, several of the participants contested this view, saying that they felt there was much to be positive about, things like the halving of world poverty between 1990 and 2015, and, of course, advances in technology which made products and services at once more efficient and affordable. Served me right for not realizing that entrepreneurs are by nature the most optimistic people on earth. The discussion ranged from venture capital, blockchain, the latest developments in the mobile banking system and lots more. One big problem identified was the difficulty entrepreneurs from regions like Africa have in attracting capital. Conversely, funders constantly complain about the difficulty of finding good investments for their surfeit of liquidity. I learned that there are new models of venture capital emerging, including what is effectively an outsourcing of management for groups of investees to high-powered teams of experienced CEOs, CFOs and COOs. I think it’s fair to say every participant came away from the gathering with at least one new idea and several valuable new contacts.